The start of the school year is just around the corner, which means that parents will need to start back to school budgeting for supplies, lunches, and gear. While back-to-school shopping can be pricey, there are multiple ways you can slash costs. Below are a few ideas to help keep your family’s back-to-school budgeting under control and organized. 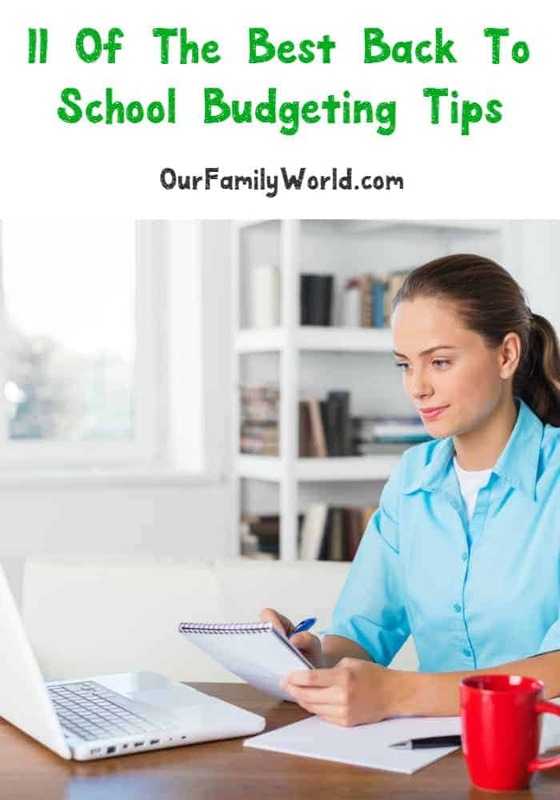 What do you do to keep your back to school budgeting organized? Do you have any tips you use to stay within your budget? Let us know in the comments! Make a list of all school supplies that your child will need. With many schools experiencing budgeting cuts, some classrooms are also requiring parents to foot the bill for basic supplies. Call your child’s school and ask if you will need to contribute classroom items such as paper towels, liquid soap, scissors or rubber bands—or other vital classroom provisions. It helps so much to be prepared for back to school. Before you start shopping at office supply or department stores, check out which school supplies your local dollar stores may have available. They often have plenty of the necessary items your child will need like pens, pencils, notebooks and paper. In addition to visiting your local dollar shops, you should also consider checking out stores like Big Lots, Costco or Sam’s Club. Many of these stores offer items in bulk along with closeout items. Check carefully and you’ll be certain to find some real bargains on school supplies, clothing and pre-packaged lunch items like snacks and juice boxes. You might also consider getting together with other parents in the neighborhood and sharing bulk purchases. Just before school starts, you will need to pull out a Sharpie and label all of your child’s belongings. Books, clothing, pencil cases, iPods should all have some form of permanent identification to prevent any of your child’s items from winding up in a collective bin. Your thoughtful budgeting may be compromised if you must constantly replace lost, stolen or damaged school supplies. Explain to your child that all of his or her school supplies have value and should be cared for and stored properly to prevent damage, loss or theft. Budgeting for school means more than coming up with costs for classroom supplies. Create a more honest and realistic budget by pricing immunizations, uniforms, sporting equipment, bus and meal fees. Why pay hundreds of dollars for musical instruments or athletic equipment if there is the chance that your child may grow bored and move on to another activity? A better option is to rent what you can. If you think your child may be serious about these endeavors, you can always look into rent-to-own options or purchase when they start to become more dedicated.Not every kid plays music this well! Whenever your child tags along for back-to-school shopping, your cart is likely to wind up with additional clothing, lunchboxes, and toys that weren’t on the list. The best way to stick to your list is to shop for school supplies by yourself. Have your child accompany you on a separate trip where he or she can select and try on clothing and shoes. Put out a pot of coffee, make a batch of cookies and invite other neighborhood moms to your home for a back to school party and swap extra supplies! Have everyone bring over any extra or gently used school items, sporting equipment, uniforms or clothing that no longer fits. This way everyone can share and find things to help their child, while having fun with budgeting. Labor Day weekend is the traditional time when stores have their back-to-school sales. Get advance notice of any upcoming specials by signing up for your favorite store’s e-mails or coupons. Also, 13 states and the District of Columbia offer a sales tax-free school-shopping weekend for all school-related materials. Find out if your state offers this option and then take advantage of the extra savings. Start budgeting as much in advance as possible. Many parents dread the back-to–school routine and find themselves scrambling to purchase supplies at the last minute. Unfortunately, they literally pay the price for procrastination. By creating a school supply game plan at least a couple of weeks in advance, you’ll be able to keep your children happy and your back-to-school budget under control. *About the author: Carrie Atkins is a stay-at-home mother of five, and also writes content for sites conducting reverse phone lookup services. These are really great budgeting tips! Knowing school supplies in advance really helps!